In 2016, Canada reported a US$24.4 billion trade in goods surplus with the United States, while from the US perspective this surplus was reported as US$16.3 billion, a difference of US$8.1 billion. It may be expected that the bilateral trade statistics of one country would mirror those of its trading partners. In practice, this is rarely the case, as countries use different data sources and statistical methods. These factors can lead to differences or "asymmetries" when comparing the bilateral trade statistics of two countries, like Canada and the United States. In order to help data users understand and monitor these differences, Statistics Canada will begin publishing bilateral trade in goods comparative tables for key trading partners, starting with the United States. These tables will be published on the Canada and the World Statistics Hub beginning in March 2018, and will be updated on a quarterly basis. There are numerous reasons for the differences in the customs-based statistics produced by Canada and the United States, however, the application of international standards in recording imports and exports of goods is the main source of asymmetry, particularly the attribution of trading partner. Both Canada and the United States follow international standards with respect to the attribution of the trading partner. The international standards recommend that imports be allocated to the country of origin as opposed to the country from which the good was last shipped (referred to as the country of export). Total exports (which also include re-exports of goods originally produced in another country) are attributed to the country of last known destination. The application of these standards results in trade asymmetries. For instance, suppose a $50 million shipment of laptops is exported from China to Canada. China records this in its customs-based trade statistics as a $50 million domestic export to Canada and Canada records an import of $50 million from the country of origin China. One month after the $50 million shipment of laptops arrives in Canada, it is re-exported to the United States. The United States records this as a $50 million import from China (as China is the country of origin), although the country of export is Canada. Canada records it as a re-export to the United States and includes it in its value of total exports to the United States. Ultimately Canada reports a $50 million export to the United States and the United States reports a $50 million import from China, resulting in a $50 million asymmetry. If this was the only transaction in the month, Canada would show a $50 million trade surplus with the United States, and the United States would show a $0 trade balance with Canada. Looking to the 2016 customs-based trade in goods data, Canada reported US$297.6 billion in total exports to the United States, which is US$19.8 billion higher than the US$277.8 billion in imports that the United States reported from Canada. Most of this difference is the result of the attribution of trading partner for Canada's re-exports of foreign-origin goods to the United States. The value of Canada's re-exports to the United States totalled US$30.6 billion in 2016. Since US imports are attributed to the country of origin of the good, these re-exports from Canada are not included in the US value of imports from Canada. In addition, Canada's value of re-exports to the United States includes goods of US origin that are returned to the United States, which were valued at US$14.3 billion in 2016. In this case, the United States does not attribute these to the country of origin, which is the United States, but to the country of export, Canada. In order to compare Canada's exports to the United States with US imports from Canada, the remaining US$16.3 billion of Canada's re-exports of foreign-origin goods must be removed from Canada's original value of exports to the United States (US$297.6 billion), as the United States shows these as coming from other countries. This reduces Canada's exports to the United States from US$297.6 billion to US$281.3 billion and narrows the asymmetry from US$19.8 billion to US$3.5 billion. These adjustments are shown in Table 2. Accounting for US imports of Canadian-origin goods from countries other than Canada widens this remaining asymmetry. Since the United States attributes customs-based imports to the country of origin, any good imported into the United States that originates in Canada is included in US imports from Canada regardless of the country of export. These goods were not exported from Canada to the United States and therefore are not included in Canada's exports to the United States. As an example, a $50 million shipment of automotive parts is exported from Canada to Mexico. Canada records this as a domestic export to Mexico and Mexico as an import from the country of origin Canada. Several months later, Mexico re-exports this $50 million shipment to the United States. The United States records this as a $50 million import from the country of origin Canada, although the country of export is Mexico. Unless there is an amendment made to the final destination of the shipment in the export documentation in Canada, Canada continues to attribute this export to Mexico. Ultimately Canada records a $50 million export to Mexico and the United States records a $50 million import from Canada. If this was the only transaction in the month, Canada would show a $0 trade balance with the United States and the United States would show a $50 million trade deficit with Canada. 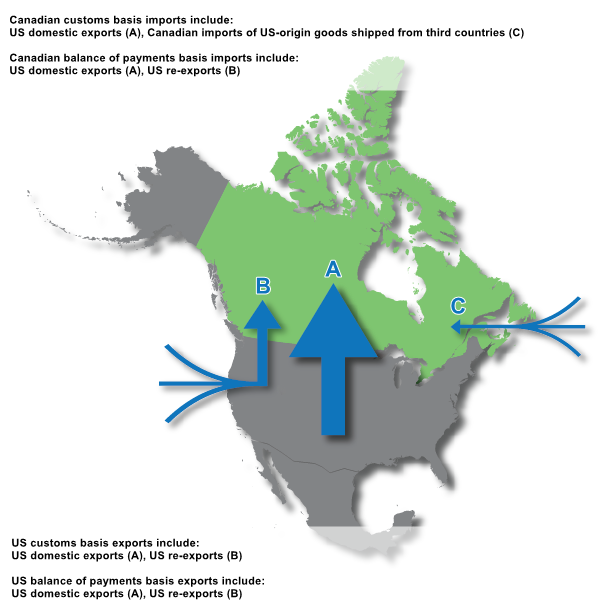 Trading partner attribution also leads to asymmetry when looking at the reverse scenario, of Canada's imports from the United States and US exports to Canada. In this case, suppose a $50 million shipment of cell phones is exported from China to the United States. China records this in its customs-based trade statistics as a domestic export to the United States. This shipment is recorded by the United States as an import from China. If the same shipment of cell phones is later shipped to Canada from the United States, Canada attributes this import to the country of origin China, although the country of export is the United States. The United States records it as a re-export to Canada and includes it in its value of total exports to Canada. Ultimately Canada reports a $50 million import from China and the United States reports a $50 million export to Canada, resulting in a $50 million asymmetry. If this was the only transaction in the month, Canada would show a $0 trade balance with the United States and the United States would show a $50 million surplus with Canada. Other factors contributing to the asymmetry in Canadian and US customs-based trade in goods data include revision policies and trade valuation. Beginning with revision policies, Statistics Canada and the US Census Bureau follow different schedules for the publication of revisions to trade statistics. Factors influencing revisions include late receipt of import and export documentation, corrections applied to previously submitted customs forms, and replacement of estimates with actual figures. Statistics Canada and the US Census Bureau revise their data at different times and frequencies. The latest publication of revisions to 2016 customs-based trade in goods data by the US Census Bureau was in June 2017. In contrast, the latest publication of revisions by Statistics Canada was in February 2018. The trade data of both countries therefore reflect different vintages of data, which may result in discrepancies, as revisions are included in one data source but not the other. Furthermore, Canada and the United States take different approaches to valuation in their trade statistics. Import and export values can include or exclude portions of the costs associated with shipping the goods. For example, the reported values may include costs incurred up to the port of exit in one country or the port of entry in another. This results in different values being reported for the same shipment in one country's exports in comparison to another country's imports. The value of US imports of goods from Canada is based on the price payable for goods imported into the United States (referred to as the customs value), not including charges for shipping the goods, like insurance and freight. On the other hand, the value of Canada's exports includes the portion of the charges for shipping the goods to the port of exit and onto the exporting carrier in Canada. Therefore, due to this method of trade valuation, Canada's value of exports to the United States is conceptually higher than the US value of imports from Canada. For the reverse trade flow, the value of Canada's imports from the United States includes charges for shipping the goods to and loading them onto the exporting carrier at the port of exit in the United States. The value of US exports includes charges for shipping the goods up to the exporting carrier at the port of exit in the United States. Essentially, the difference in this case is the cost of loading the shipment onto the carrier. Therefore, Canada's value of imports will be slightly higher conceptually than the value of US exports. This difference cannot be quantified as neither Canada nor the United States reports a separate value for freight charges from the customs value for this flow of trade. This discussion has so far focused on customs-based trade in goods data. The customs-based statistics provide a measure of the change in the stock of material resources within a country that result from the physical movement of goods across the border. Balance of payments adjustments are made to the customs-based data in order to conceptually align them with other macroeconomic account statistics, such as gross domestic product, based on international standards. These data provide a measure of economic transactions in goods between Canadian residents and non-residents that result from a change in ownership. The attribution of the trading partner is a significant factor in the asymmetry on a balance of payments basis. As with the customs-based data, US imports on a balance of payments basis are attributed to the country of origin. Canadian total exports include re-exports of foreign goods and therefore include shipments that are not included in US imports from Canada. The resulting asymmetry in this case is the same as with customs-based US imports from Canada and Canadian exports to the United States, as illustrated in the example of the laptop shipment above. 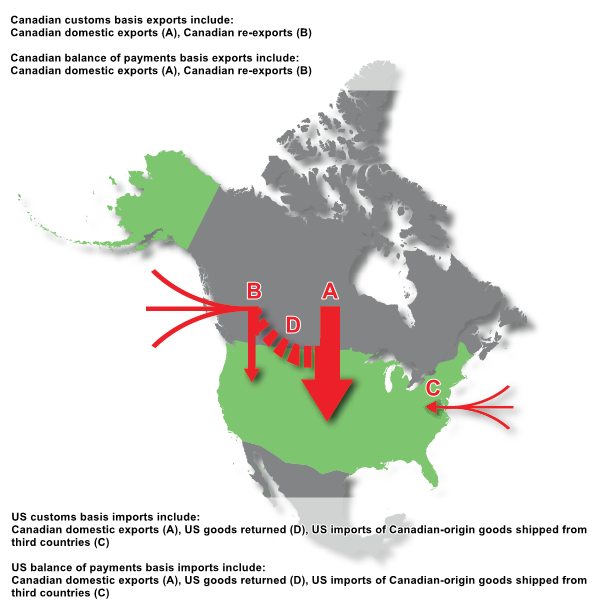 On a balance of payments basis, US imports from Canada include Canadian-origin goods imported from countries other than Canada, which are attributed to other countries of destination in Canadian export data. Canadian exports include re-exports of foreign-origin goods, which are attributed to other countries of origin in the US import data. Asymmetry due to trading partner attributions is less significant in the reverse scenario, regarding Canada's imports from the United States and US exports to Canada. Unlike customs-based imports, Canada's balance of payments based imports are attributed to the country of export of the good rather than the country of origin. As noted, the international standards stipulate that the balance of payments basis data measure trade resulting from a change in ownership, and both Canada and the United States are in line with these standards. The Canadian perspective is that the country of export reflects the location of the last owner of the good. Canada's imports therefore include all exports shipped from the United States to Canada regardless of the country of origin of the goods. For example, suppose that a $50 million shipment of cell phones is exported from China to the United States. As with the customs-based data example, China records this as a domestic export to the United States. This shipment is recorded by the United States as an import from China. If the same shipment of cell phones is then later shipped to Canada from the United States, Canada attributes this import to the country of export, which is the United States, although the country of origin is China. The United States records it as a re-export to Canada and includes it in its value of total exports to Canada. In this case, the trade statistics of Canada and the United States are closely aligned, as Canada reports a $50 million import from the United States and the United States reports a $50 million export to Canada. Although some balance of payments adjustments are shared between the two countries, these are largely compiled independently from different data sources, and may result in differences between the reported imports of one country and the reported exports of the other. Balance of payments adjustments that may lead to asymmetries include trade definition (like repairs), valuation and residency, and timing. Differences in bilateral trade statistics are common and are becoming more important to understand with increasing globalization. As noted, there are a number of conceptual reasons for the differences in the bilateral trade in goods statistics produced by Canada and the United States. The publication of bilateral comparative tables is a step toward helping data users make sense of the data and use them appropriately. The country of origin for imports is the country in which the good was grown, extracted or manufactured. For imports, Statistics Canada also records the country of export or the place of direct shipment, which is the country from which the good was shipped to Canada, and is not necessarily the country of origin of the commodity. Imports on a balance of payments basis are attributed to the country of export in Canada's statistics. Total exports include both domestic exports and re-exports. Domestic exports include goods grown, extracted, fished or manufactured in Canada as well as goods of foreign origin that have been materially transformed in Canada. Re-exports are exports of goods of foreign origin that have not been materially transformed in the exporting country. Canada's re-exports to the United States include re-exports of foreign-origin goods as well as US goods returned to the United States. The United States attributes imports of US origin goods – in other words, goods of US origin returning to the United States from Canada – to the country of export Canada. All values are in US dollars unless otherwise noted. Data sourced from the US Census Bureau and the Bureau of Economic Analysis were published in US dollars. In order to align the currency, Statistics Canada data, both on a customs and balance of payments basis, were converted to US dollars using the annual average of the Bank of Canada's monthly average noon spot rate for each year. In general, merchandise trade data are revised on an ongoing basis for each month of the current year. Current-year revisions are reflected in both the customs and BOP (balance of payments)-based data. The updated Canada and the World Statistics Hub – United States (Catalogue number13-609-X) is now available from the home page of our website. This new product illustrates the nature and the extent of Canada's economic and financial relationship with the United States using interactive graphs and tables. This product provides easy access to information on trade, investment, employment and travel, including merchandise trade by Canadian provinces and US states.